Wherein two astronauts go on a secret mission to an invisible planet? Ruiz Tremello & Marguerite are in New Northunderlandshiretonville County, England, discussing the 1960 short story, "Planet of the Condemned", by Robert Murphy. 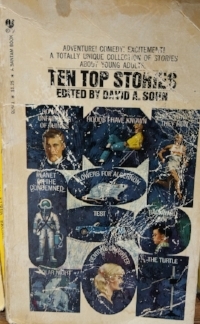 This short story was discovered via a 1985 collection called "Ten Top Stories", which contained ten stories of varying quality. In terms of Science Fiction, Robert Murphy apparently only ever wrote 4 short stories and published one short story collection, though Goodreads only contains his numerous nature books. If anyone has any copies of Robert Murphy's 1966 collection, "The Phantom Setter, and Other Stories", we'd love to read it!